Ice-cream is the favourite of people young and old and it is the catchphrase of the frozen dessert world. The yummy, cold, flavourful, eye-catching ice-cream stimulates all minds of whoever goes through its daintiness. 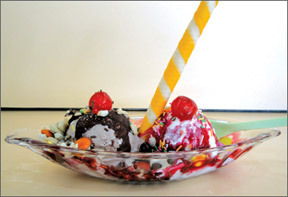 Situated next to the sacred Nallur Kovil, Point Pedro Road in Jaffna, the Rio Ice-Cream Parlour provides the ultimate ice-cream experience for all insatiable ice-cream lovers in the country. One can find 40 different ice-cream varieties on the Rio Ice-Cream Parlour menu that comes with more than 10 flavours. Rio Ice-Cream has different flavours, colours, sizes and various toppings such as nuts, syrups, plums, candy, powders, prepared fruit toppings, frozen fruit and cookies. 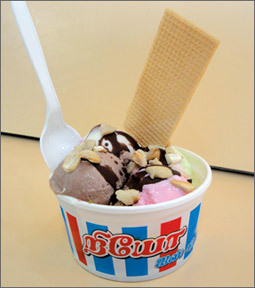 Rio ice-cream has been rewarded as the best ice-cream parlour in Jaffna by the Jaffna Municipal Council. The company is employing 25 associates. In addition, the company is in the process of providing ice-cream to several hotels in Jaffna. 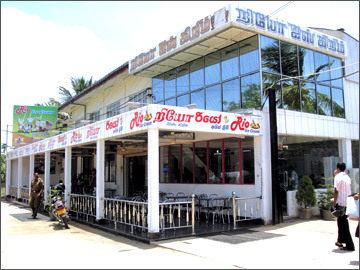 The Rio Ice-Cream Parlour gets nearly 500 customers per day and this number increases during the Nallur festival. In addition to the main Rio Ice-Cream Parlour, the company has deployed three mobile ice-cream vending vehicles in the Jaffna town. The owner of Rio Ice-Cream Company Ratnam Jeyabaskaran said the parlour has become an attraction for locals and tourists alike. Rio Ice-Cream Company has a separate unit with equipment to manufacture ice-cream. “Our ice-cream has no chemicals and, it’s all natural. We use more milk and less water and that makes our ice-cream more tastier. My aspiration is to give a better service to the customers and not to make a huge profit giving low quality products to the customers,” Jeyabaskaran said. 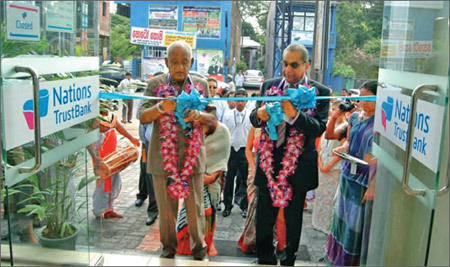 Nations Trust Bank (NTB) opened a branch in Malabe, a town which is regarded as a growing modern hi-tech city. 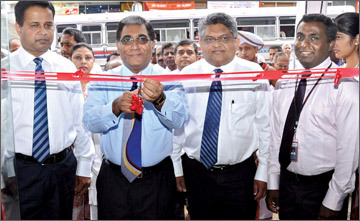 The new branch is based on the bank’s standard design concept offering the ultimate in international banking standards and unprecedented customer service and is conveniently located on Athurugiriya Road, Malabe, The people of Malabe can now experience 365 day banking with extended banking hours with the entry of Nations Trust Bank to this locality. NTB has been in operations for the past 11 years and has grown in strength and stability offering a diverse range of products and services, which has enriched its position as a customer centric bank in the financial industry. The offerings include private banking and Inner Circle Membership, Platinum and Gold membership for SME customers, Personal Banking Centres, a 24 hour Customer Contact Centre and the American Express Card Franchise all of which have helped to win over and maintain a strong and loyal customer base in a short period of time. With a continuous growth in its branch network Nations Trust Bank offers a wide range of personal banking products from traditional to innovative products such as the Personal and Kidz Investment Planner and the Bank-At-Your-Doorstep service. Apart from providing personal financial solutions to individual customers, Nations Trust Bank also provides a wide range of customized propositions to Small and Medium Entrepreneurs (SME) including Working Capital Finance and Business Expansion Finance. 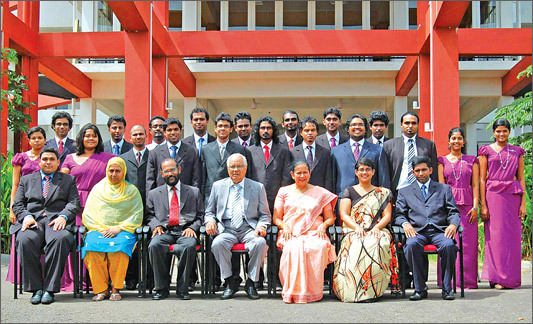 The first batch of students that concluded the BTEC Edexcel HND in Interactive Media from the Faculty of ICT and Media of South Asian Institute of Technology and Medicine (SAITM) will be progressing towards the third year of BSc in Computing with Interactive Media offered by the prestigious University of Buckinghamshire, UK. SAITM’s degree in Interactive Media is the first Multimedia degree offered in Sri Lanka. With an ever increasing student intake, SAITM’s Faculty of ICT and Media hopes helping the nation by providing students with a career in the lucrative creative industry. SAITM has some of the best training facilities in the field. Dedicated multimedia lab, Sri Lanka’s largest iMac lab, proposed studio facility, large library and the best panel of lecturers. The fifth intake of the Faculty of ICT and Media is now open and the academic year will commence on the last week of September. Abans conducted a cookery demonstration of the "Easy Cook" convection oven, at their Kollupitiya Elite Showroom last week. There was a full house at the demonstration and all the Easy Cook appliances that Abans had in stock were snapped up by those present at a special promotional price. The Easy Cook convection oven is an appliance that cooks healthy fat-free and cholesterol-free complete meals speedily while saving electricity and valuable time. Oven quality cooking combined with speed, Easy Cook is a boon for different cooking uses in the home. It helps to cook the tastiest, healthiest meals in minutes - totally fat-free. Dr.Sam L.de Zoysa a visitor from England, who was present at the demonstration, commented that the Easy Cook was an appliance that every household should have. He said that oil in the food was harmful to human health and was the root cause of many illnesses. "With an appliance such as the Easy Cook you can cook almost everything the healthy way without oil and never miss out on your favourite recipes," he added. This oven fries without oil, steams, barbecues, roasts meat, chicken or fish, grills, and bakes bread/cakes/biscuits/pastries and scones which rise upto 40% higher much quicker. Knowledgeable gourmets swear by convection cooking and culinary experts predict that it will be the cooking method of the 21st century. The reason is that when cooked in a traditional oven the food tends to burn and dry out at the side of the heating source. 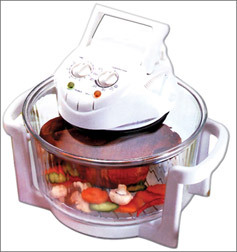 But the Easy Cook has a powerful motor that circulates hot air all around the food which sits raised on a rack. The result being that the food gets cooked quickly and evenly on all sides, remains juicy inside and does not burn but browns beautifully all over. No wonder the best restaurant kitchens the world over use convection ovens. The advantages of Easy Cook are numerous. To mention a few: it fries chips without oil and cooks fat-free meals without any oil or grease; it cooks evenly on all sides; it seals the natural flavours and nutrients of the food; it does not smoke or burn; it does not emit radiation; it cooks entire meals fast and clean; it cooks and barbecues indoors without a mess; it lets you observe the food while cooking; it has an easy self-cleaning wash action; it save time, money and electricity. This oven comes with a special fluted break-resistant bowl, low rack/cake cooler, dual height rack, lid stand, special purpose thongs and an instruction booklet with 52 favourite recipes. It is reasonably priced and is available on interest free easy payment terms from all Abans Showrooms islandwide. TKS Finance Limited is offering customers absolute flexibility of now choosing the maturity date of their fixed deposit completely at their own discretion and has brought a fresh breath of welcome air into the hitherto rigid finance field. This is destined to bring much relief to the depositors as thus far they were compelled to fit into a definite period block of three months, six months or one year etc., irrespective of their actual need to withdraw against their specific deposit period. Thus far, the practice had been to pay a penalty or forego a portion of interest when a withdrawal is made prematurely. Thanks to this pioneering spirit of TKS Finance, depositors can now easily enjoy the privilege of planning their own investment as per their own wish. Explaining this innovation, the TKS Finance Limited CEO, Rasika Kaluarachchi said that as a finance company wishing to connect with people as never before seen in this sector, there are some more innovations lined up to be introduced to the people as time goes by. He said the new requirement in insuring all fixed deposits of Registered Finance Companies under the Deposit Insurance Scheme by the Central Bank of Sri Lanka Monetary Board under Regulation No. 1 of 2010, Section 32(A) to 32(E) is a much sought-after welcome relief for depositors reeling under the mismanaged fiasco of some of the finance companies in the recent past. Hence, TKS Finance Ltd maintains the stipulated deposit base with the Central Bank in accordance with this regulation. The CEO emphasized that while innovation is the way forward, it shall never be ill-planned or hastily arranged where TKS Finance Limited is concerned. "This is precisely why we shall always be utterly and completely focused on good corporate governance with strict implementation of proper financial risk management systems, to resolutely protect all our stakeholders while offering an excellent customer service to the doorsteps of the customers". "Our mission is to be the leader in revolutionizing the finance industry in Sri Lanka, with innovations towards building trust to new heights with good values" Rasika Kaluarachchi concluded. NDB CEO Russell de Mel opening the Pilimathalawa Branch. Regional Manager Ajith Beminiwatte, Vice President - SME and Retail Banking - Regional Manager Raj Aboobucker and Pilimathalawa Branch Manager Anusha Siriwardhana look on. NDB Bank recently opened its new branch in Pilimathalawa expanding its branch network further interior in the hill country. With this opening, the NDB Bank branch network has now increased to 55. Pilimathalwa is home to a talented people who are masters in the art of brass craft. They have been crafting masterpieces for palaces and noble homes dating back to the era of the Senkadagala Kingdom. Today Pilimathalawa's brass industry has attracted the international market. The area is also renowned for its tea.